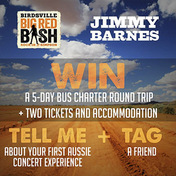 Looking forward to playing at the Big Red Bash with Jon Stevens, Diesel Music+ more in July, and I’m giving you the chance to win a 5 day bus charter round trip for you for you and a friend (from Brisbane), plus 2 tickets & accommodation valued at $795. For your chance to WIN, share your first Aussie concert experience in the comments, and tag a friend you’d like to take to the show!! Winners will be selected on Monday, April 20. *NB – Travel is only included from Brisbane to the Big Red Bash, then back to Brisbane.